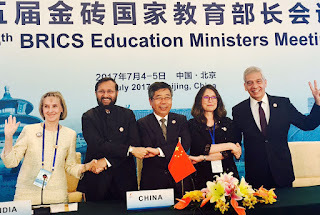 New Delhi: Meeting of BRICS Ministers of Education was held on 5th July, 2017 at Beijing, China. The Indian delegation was led by Prakash Javadekar, Minister of Human Resource Development, India. Delegation of all the five BRICS countries participated in the two-day deliberations. Speaking on the occasion, Minister of Human Resource Development, Prakash Javadekar thanked China for hosting the meeting in Beijing. He said that the Education, being the universal good, empowers everybody. It will set the tone for the world of the future. Education is a universal, apolitical agenda. It’s not negotiation, but cooperation all the way. So, increased cooperation in education is the need of the hour. He appreciated the creation of institutional mechanism in the form of BRICS Network University and BRICS Think Tank Council. BRICS Network University, where 12 universities from each of the 5 countries will engage with each other in education research and innovation, is another commendable initiative. Five areas of cooperation are prioritized which are Communication and IT, Economics, Climate Change, Water Resources and Pollution, and BRICS study. India will participate whole-heartedly in all these cooperative efforts. Javadekar highlighted some of the initiatives of the Govt. of India in education. He specifically spoke about the National Institutional Ranking Framework (NIRF) which provides a relative ranking of Indian institutions, India’s indigenous MOOCs platform, SWAYAM, which has already hosted over 480 courses online and, this year, plan to host 2000 courses and GIAN (Global Initiative for Academics Network) under which 600 professors from 62 countries have already conducted their courses in India and, this year, we expect to receive another 800 faculty from across the world. The Minister spoke about India’s research initiative, IMPRINT, which identifies priority areas for research for India, National Digital Library, which provides over 7.2 million online resources free of cost and is ever expanding National Academic Depository (NAD), Smart India Hackathon, which involved over 40000 students in solving over 300 problems received from various sources. Delegations from other BRICS Member states, similarly, spoke about education systems of their countries, initiatives taken by them and identifying the areas of future cooperation among BRICS Member States. There were deliberations on the Beijing Declaration on Education which was discussed thereafter in the Senior Officials’ Meetings held a day before on the 4th July 2017. Beijing Declaration identifies some specific activities to deepen the cooperation among the BRICS Member States, encompassing the entire spectrum of education from school and higher education to vocational and technical education. Before the meeting of Education Ministers, an international conference of Vice-Chancellors of the Universities participating in the BRICS Network University (BRICS-NU), meeting of International Governing Board (IGB) of BRICS-NU and meetings of International Thematic Group (ITGs) of BRICS-NU were held in Zhengzhou, China on July 1-3, 2017. During the meeting, the participating countries signed the Regulation for the IGB and the statutes for the ITGs, thus completing the structure of the BRICS-NU. At the conclusion of the BRICS Education Ministers’ meeting, a bilateral meeting was also held between the Minister of Human Resource Development, India and the Education Minister of China, Mr. Chen Baosheng when bilateral cooperation between India and China was discussed.